Visit Our Showroom on Kennett Pike (DE 52)! A family-owned business since 1950, Yocum Shutters and Blinds is the name to know in Wilmington for window shades, plantation shutters, and more. We provide exceptional quality in every way. From first-class products to secure installations to unmatched customer service, our number-one goal is to make customers happy. If you want to discover the difference that 65+ years of hands-on experience can make, then you've come to the right place. At Yocum Shutters and Blinds, we've been outfitting local homes and businesses with exceptional window shades, interior shutters, horizontal blinds, and more since 1950. It's no wonder how we've managed to thrive for so many decades: Our commitment to five-star customer service is unmatched. 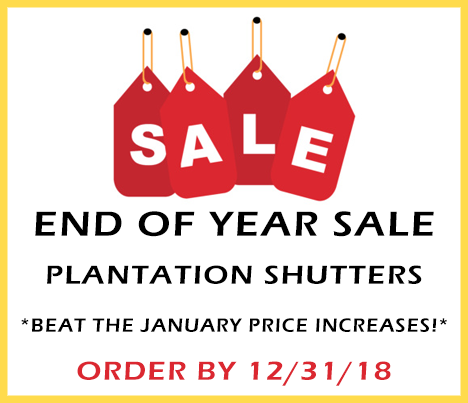 When you work with us to find the right plantation shutters, wooden blinds, or Roman shades for your windows, you'll be treated with the utmost professionalism, attentiveness, and care. Your satisfaction is what matters to us above all else, and we'll go the extra mile to make sure you're completely happy with whatever window shades, shutters, or blinds you choose. Give us a call to speak with our small but mighty team—we're always here to help! As heard on the radio on (1210 AM)! At Yocum Shutters and Blinds, we're proud to serve residents and business owners alike throughout the Wilmington area. Whether you're looking to revamp the look of your outdated home or you're setting up a new office, we can't wait to help you pick out the perfect window shades or blinds for your space. We work with customers in Wilmington, New Castle, Newark, Glasgow, Bear, Middletown, Woodstown (NJ), Salem (NJ), Elkton (MD), Chesapeake City (MD), and beyond. No matter where your property is located in the area, we'll come straight to you for expert installation. Being a family-owned business for so many decades has helped us learn what matters more than anything: customer service. Happy customers make us happy. That's why we've designed our consultations to focus solely on you. When you speak to us over the phone or visit our showroom, we'll carefully listen to you talk about your vision for the space and discuss factors like style preferences, energy-efficiency concerns, and budget. We'll also walk you through our extensive selection of high-quality products from the industry's top manufacturers so you aren't overwhelmed by the number of choices available to you. At the end of the day, we want to be sure your purchase—whether it's plantation shutters, vertical blinds, or cellular shades—is exactly what you want. In addition to our immense experience, we have a proven track record of excellence as we are recipients of the Angie's List Super Service Award and the 2015 "Best of Wilmington" Award. For your added protection and peace of mind, we are fully licensed, bonded, and insured. Call or e-mail us today to hear more about our product selection or to schedule your consultation! And don't forget to listen for us on 1210 AM, "The Big Talker."